Pokhara Sarangkot Hiking tour offers a picturesque mountain view with scenic local villages of different culture and tradition of Nepalese natives. Situated in the western part of Nepal at the height of about 1700 meters. Sarangkot is very popular for mountain scenery. 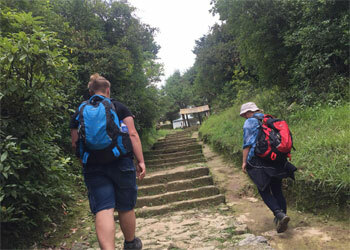 Hiking around Pokhara Sarangkot is one of the best hiking with family and friends having the splendid view of snow-capped mountains and enjoying the green hills. Our Pokhara Sarangkot hiking starts early morning from Pokhara city with a drive near Sarangkot, you will see the best sunrise and mountain vista consisting of the mighty peaks such as the Annapurna, Himalchuli, Machhapuchhare, and Lamjung Himal. Sarangkot tower hiking will amaze you witness the sunrise over the White snow-capped Mountains of Whole Annapurna and Dhaulagiri Ranges including fishtail view After you will trek down to Pokhara via through different castes villages enjoying the hike in the countryside. Day 01: - Pokhara drive to Sarangkot hiking down to Pokhara. Early morning drive to Sarangkot by private car . Enjoy the sunrise view form tower, Sarangkot offers superb Himalayan vista consisting of the mighty peaks such as the Annapurna, Himalchuli, Machhapuchhare, and Lamjung Himal. Spend your night here. after breakfast at Sarangkot we will trek down to Pokhara.will walk mostly downhill through nice village, jungle and fileds. about 3 hrs hiking. Government license holder experienced, trekking/hiking guide (trained in Wilderness First Aid& altitude sickness) with all his expenses. personal hiking gear, all personal expenses, travel insurance.